The Geemarc AmpliPOWER 50 Amplified Telephone is designed specifically for those with a considerable hearing loss. The telephone features all the latest functions you would expect from a market leader such as speakerphone & hands-free options, as well as, extra loud volume of up to 60dB and extra large buttons for easy day to day operation of the telephone. The Geemarc AmpliPower 50 Amplified Telephone is a simple to use telephone that has the ability to change your life for the better. We firmly believe that it can help you get back in touch with friends and family, and put an end to calls where you struggle to catch everything being said at the other end of the phone line. 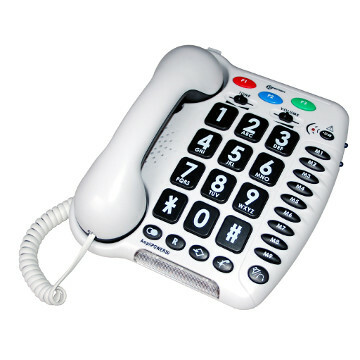 The volume of the Geemarc AmpliPower 50 Amplified Telephone is fully adjustable. An easy to use slider sets the volume, and ranges from a normal receiver volume to an ear-blasting 60db which is approximately 8 times as loud as a standard telephone. You can leave this adjustable slider where it is so there is no need to adjust the volume for every call, but it does let you turn the volume up or down depending on how loud the other person is when they are speaking to you. Tone control also helps you adjust how the person's voice comes across to you, boosting up difficult to hear elements of speech like the letter "T" and "S" in conversation that can easily be missed if you are hard of hearing. This amplified telephone plugs into your standard telephone socket, and requires a power socket nearby. We include all the cables and adapters you will need to get going straight out of the box. The great thing about this telephone is how easy it is to use right away. It has a smart and simple design, and there are no activation buttons for answering a call; simply pick up the receiver and start talking. This makes it ideal for people who are used to a classic telephone, helping them make the often tricky transition to a new piece of technology straightforward - no need to constantly refer to the instructions or reteach someone how to use a telephone.